What becomes of the beautiful statues of Lord Ganesh once the Ganesh Chaturthi festival is over? They're placed in a body of water and left to disintegrate in a process called visarjan (immersion). In Mumbai alone, more than 150,000 statues are immersed each year! Find out when and where it happens in this Mumbai Ganesh visarjan guide. The largest Ganesh statues, on display to the public, are usually immersed on Anant Chaturdasi -- 11 days after the first day of the Ganesh festival. However, many people who keep a Ganesh in their homes choose to perform the immersion much before this. There are no hard and fast rules as to when it's done. Rather it's up to personal preference. However, the immersions do follow a schedule and are only performed on selected days. These are as follows. One and half day Ganesh Visarjan – September 14, 2018. Three day Ganesh Visarjan – September 15, 2018. Five day Ganesh Visarjan – September 17, 2018. Gauri Visarjan -- September 17, 2018. Gauri idols, commonly taken home on Gauri Avahan (on September 15, 2018) and worshiped along with Lord Ganesh in Maharashtra, will be immersed on this day. Goddess Gauri is another name for Goddess Parvati, the mother of Lord Ganesh. Seven day Ganesh Visarjan – September 19, 2018. Anant Chaturdashi last and biggest day of Ganesh Visarjan – September 23, 2018. Immersion of the Andhericha Raja takes place on Sankashti Chaturthi -- September 28, 2018. The procession starts out at 5 p.m. on the 28th and goes for around 20 hours through the night. The idol will reach the immersion point late morning on September 29. If you want to see the largest and most famous Ganesh statues, you'll need to head to Girgaum (Girgaon) Chowpatty on Marine Drive in south Mumbai. (See the most convenient Mumbai hotels to stay in). Juhu Beach in Mumbai's western suburbs is another popular place of immersion. (See the most convenient Juhu hotels to stay in). As too is Versova beach. Powai Lake, in Mumbai's central suburbs, receives a lot of smaller states that are immersed by families before Ananta Chaturdashi. The processions follow set routes, with details of the major ones outlined here. South Mumbai -- JSS Road and Kennedy Bridge Road from Nana Chowk, both leading to Girgaum Chowpatty. Central South Mumbai -- Veer Kotwal Garden in Dadar West, as well as Dr. Ambedkar Road. Juhu -- The roads along the beach near Palm Grove hotel. Powai -- Adi Shankaracharya Marg. Mumbai Police has divided the routes into three separate parts – a route for immersion processions, a route for the public who is returning from immersion points, and regular traffic routes. Detailed maps with diversions and updates are available from @MumbaiPolice on Twitter before the event. The large Ganesh statues take a long time to reach the ocean and be immersed. The slow moving processions commonly start out mid morning and go throughout the night, with the statue only being placed in the water early the next morning. Many roads are closed to traffic, so do take the Mumbai local train where possible. If you come by train, try and arrive at Grant Road railway station by around 1-2 p.m, then make your way slowly to Girgaum (Marine Drive) Chowpatty. It really starts getting crowded around sunset, from 6.30 p.m. onward. Expect hundreds of thousands of people to still be there at sunrise too! The most famous idol, the Lalbaughcha Raja, gets immersed at 8 a.m in the following morning. The streets are filled with loud music, drumming, dancing, and fire crackers. If you have sensitive ears, do wear ear plugs. Maharashtra Tourism sets up a special elevated air-conditioned pavilion for foreign tourists at the immersion point at Girgaum Chowpatty. It has facilities such as mobile toilets, wireless Internet connection, and clean drinking water. Transport to and from hotels, or a designated pick-up point, is also provided. Foreign tourists need to register in advance with Maharasthra Tourism for a pass. The huge crowds mean that experiencing the immersions can be daunting. Therefore, it's a good idea to go on a tour if you're feeling concerned about it, which is what I did with Grand Mumbai Tours. Here are the details of their Ganesh festival tours. Reality Tours and Travel also offer super interesting and informative Ganesh Chaturthi tours on immersion days. The tours visit a public Ganesh display in the Dharavi slum potter's colony, and a number of family homes in Dharavi, as well as the community that originally started the Ganesh festival. It concludes at Girgaum Chowpatty, where the immersions of the idols take place. Do note that due to the ban on DJs this year, the Dance Ganesh Visarjan street party won't be taking place as usual. Why are the Statues Immersed? Find out more in this Essential Guide to the Ganesh Festival. 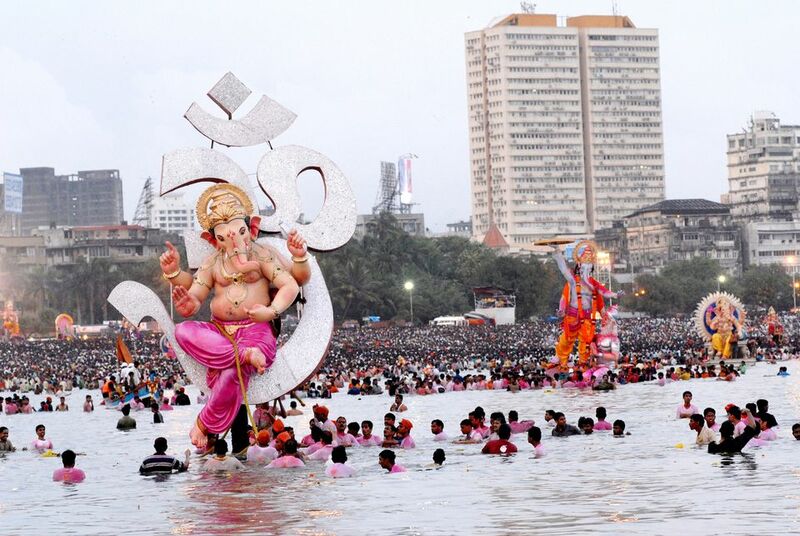 Take a look at this Ganesh Festival Photo Feature for more images of the idols being taken for immersion in Mumbai.